I have worked in youth development for as long as I have been able to receive a paycheck. My first job was in a church nursery; from there, I worked as a summer camp director and in a residential treatment center for emotionally disturbed teenagers. My experiences in remediation made me want to be more proactive, which led me to my current job with Nurse-Family Partnership (NFP) Indiana. NFP is a nationally recognized, evidence-based program proven to reduce behavioral and intellectual problems in children and increase economic self-sufficiency for families. In Indiana, NFP is implemented by Goodwill Industries of Central Indiana Inc., which supports and complements NFP with its programs aimed at increasing education and employment. The links among poverty, low education levels, crime rates, teen pregnancy and health disparities are indisputable. Research indicates that, in efforts to address these problems, the greatest long-term benefits will come from starting with babies in low-income households — even before they are born. Deficiencies apparent during the first two years of life have been accurate predictors of IQ, education attainment, criminal behavior and even the probability of becoming a teenage mother. 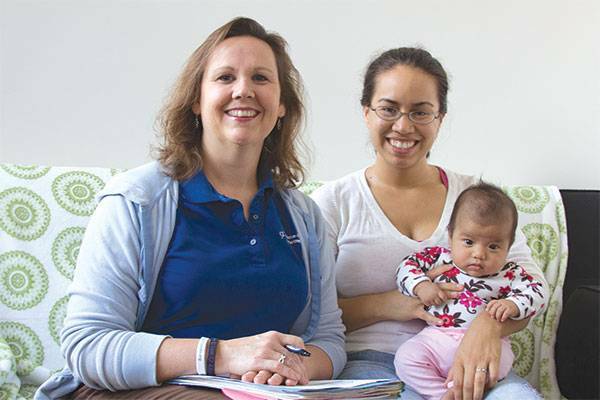 Through NFP and its other services, Goodwill Industries of Central Indiana implements programs that address these barriers, giving young mothers and families opportunities to improve their lives. NFP pairs a bachelor’s degree-prepared, registered nurse with a low-income, first-time mother for home visits and support from pregnancy until the baby turns 2. Then, exclusively at NFP Indiana, we continue to serve families through our Guides program. I am fortunate to be an NFP Guide and to work with incredible women who are often doing everything they can to raise happy, healthy children. To illustrate how we influence and support families, I will share the story of Giavonni, whose education plans were derailed when she became pregnant at 17 and dropped out of high school. Giavonni knew she wanted to be the best mother she could be, so she enrolled in NFP. Throughout their two and half years together, Giavonni and her NFP nurse Marilynn formed a strong bond, meeting once a week during pregnancy and after birth and later shifting to every other week. Marilynn helped Giavonni learn about different aspects of becoming a parent, such as having a healthy pregnancy, breastfeeding and child development. The pair focused on Giavonni’s child as well as her personal goals like moving out of her parent’s home and financially supporting her child. Once her baby was born, Giavonni decided to get a job to support her new family. She worked in a warehouse and later as a cashier. Neither held much of a career path, nor used her talent in interacting with people. She soon realized she was not making enough money to support her child and would need a high school diploma in order to achieve her goal of becoming a firefighter. As Giavonni discussed these realizations with her nurse, Marilynn, told her about The Excel Center, a high school for adult learners, also operated by Goodwill of Central Indiana Inc., which is tuition free and provides on-site, drop-in child care. With Marilynn’s encouragement, Giavonni thought about her education options and decided she wanted to return to school to not only increase her employment opportunities but also to be a role model for her children. In early 2015, Giavonni enrolled at The Excel Center and graduated by December 2015, earning two credentials in hospitality and customer service. Now she is looking for a full-time customer service job and working toward her goal of becoming a firefighter. She can’t wait to get her daughter started in preschool. Giavonni wants her daughter to grow up knowing that her education is important, and if her mom can graduate, so can she. Strong, smart and resourceful, Giavonni likely could have continued living without her high school diploma, though it would have been difficult. Her choice to finish school will positively affect the rest of her and her family’s lives. She will be able to get a better job, spend more time with her kids and be the role model she set out to be. Drop-out rates for teen parents are enormously high. Giavonni is like many young mothers in our community who too frequently see dropping out of high school as the only option to surviving. The supportive relationship that develops between a new mother and her NFP nurse influences the life path of the mom and baby, while opening Goodwill’s other resources that promote education and employment. By providing encouragement and tangible supports, we see mothers make changes in their lives that have a positive impact on their children and community. In 2012, Sarah Pennal began working to connect Nurse-Family Partnership families with high-quality childcare and parenting resources. Later, she developed and now implements the NFP Graduates Program. She has a master’s in philanthropy from the Lilly School of Philanthropy and a graduate certificate in nonprofit management from the School of Public and Environmental Affairs, both from Indiana University.